I may be a food blogger that LOVES creating new recipes for my family, but I am also a wife to a husband that works 2 jobs and is in his last year of college. I am also a mom to 2 kids that are in several different after school clubs and sports. Like most of you, we are on a tight food budget and 1 dinner out a week on a busy night would really set us back! So in between the part of my job that requires lots of fun recipe testing, we do have simple tried and true dinners that require time saving and inexpensive ingredients that we know and love. Tacos, spaghetti, and sloppy joe’s definitely make an appearance, a couple of times a month! For fun, I wanted to see if my 5 year old who is learning to read, could find the MANWICH Sauce at our local Walmart. Yep. he found it. Haha! 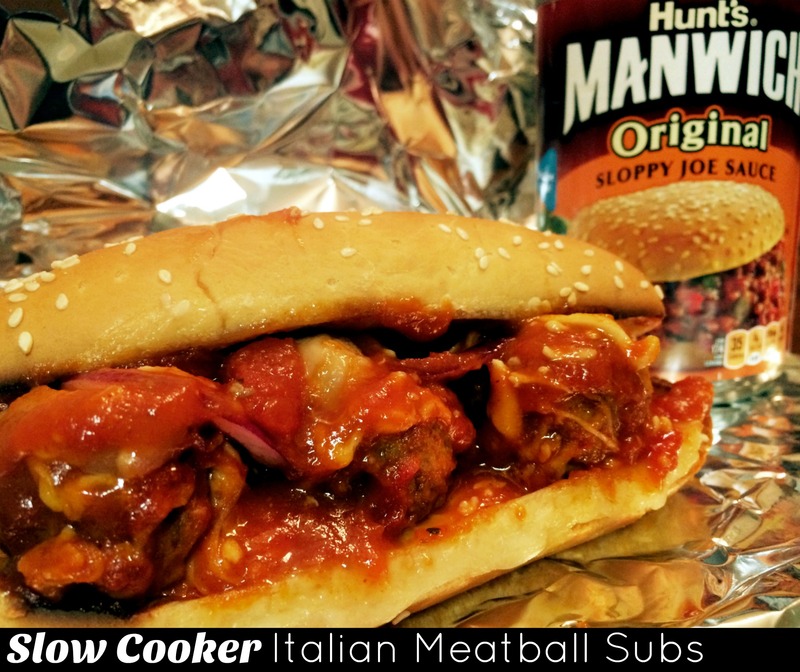 So my sister-in-law told me a while back about these meatballs she makes that used MANWICH sauce and her family had LOVED them! I finally got a chance to try it out for myself and OH MY GOODNESS! My family absolutely DEVOURED them! This was such a good recipe for us on a busy weeknight. The meatballs are broiled in the oven then go in the crock pot for 3 hours on low. After that I switched the crock on the ‘keep warm’ setting and even though we ate at different times, the meatballs were warm and ready when we were! So each of us had a freshly toasted Meatballs Subs that didn’t break the bank like delivery or take out would have! First thing I did, was mixed up the meatball mixture and rolled them into golf ball sized balls and placed them on a Pam sprayed cookie sheet lined with foil. Then I broiled them on high in my oven, 10 minutes on one side then turned them over and 5 minutes on the other (or until brown on both sides). While they were broiling I added my MANWICH sauce, Hunt’s Diced Tomatoes with Basil, Garlic & Oregano, drained and a Hunts Tomato Sauce to my Pam sprayed crock pot, and gave it a good stir. I ladled a cup or 2 of the sauce out of the crock to pour over the meatballs so you don’t have to stir the meatballs in the sauce. You don’t want them to break up. Using tongs, carefully place the browned meatballs down in the crock pot and pour the reserved sauce over the top. Turn the crock pot on low and cook for about 3 hours. After the 3 hours were up, I added a bunch of shredded mozzarella to the top of the meatballs then recovered and turned it to ‘keep warm’. Then I toasted up some sub rolls then added some provolone cheese and toasted the cheese too. Put a big old scoop of meatballs on each sub with some thinly sliced red onion and extra Parmesan cheese for those of us that wanted it! These were AMAZING! In a large bowl combine the beef, sausage, cheese, oregano, basil, parsley, garlic salt, white pepper, egg, lemon juice and breadcrumbs, mix well with your hands until all ingredients are combined well. Line the bottom of your cookie sheet with foil and spray the top with Pam Spray. Roll the meat mixture into golf ball size meatballs and place on the broiling pan. Broil on high for about 10 minutes (keep an eye on it!) turn the meatballs over and broil for 5 more minutes or until both sides are browned. In a crock pot combine the MANWICH Sloppy Joe Sauce, tomato Sauce and the drained diced tomatoes. Stir the sauce and then remove a cup or 2 of it from the crock pot. Add the broiled meatballs to the crock pot then add the reserved sauce on top to coat the meatballs without breaking them. Turn your Crockpot on low for 3 hours. 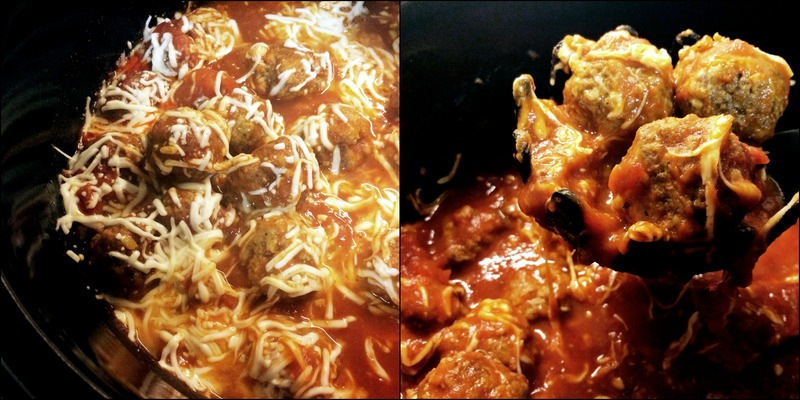 After the meatballs are done, add some shredded mozzarella to the meatballs and turn your crockpot onto warm until ready to serve. Once you are ready, toast your subs under the broiler, then add some sliced provolone and toast that as well. Top your subs piled high with meatballs, sauce, Parmesan cheese, and thinly sliced red onion if desired. in recipe for manwich meatballs recipe calls for diced red onion am I missing where this is incorporated into the recipe ?